Yesterday was a unseasonably warm day in Columbus, so I took advantage and sat on my back deck for the first time this year to do a cigar review. 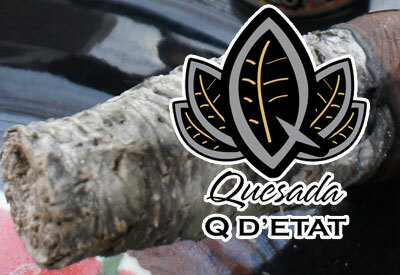 The stick was a sample I brought back from the ProCigar Festival - the Quesada Q D’Etat Molotov.These cigars were just recently released to the market and I read over at Tony Casas' site that they were limited to 1,000 boxes. I had the pleasure to watch a skilled roller at the MATASA (Manufactura de Tabacos S.A.) factory make these cigars and it looked to be no easy task. The new MATASA factory is a impressive building that the whole Quesada clan is just getting settled into. I'm sure by next year's ProCigar, it will be one of the most stunning factories in the Dominican Republic. What a interesting shape. The Molotov is one of the more unique vitolas I've seen in awhile and the cap is just as different. The little open brushed head on the end of the cap gives it the Molotov cocktail look they must have been going for, without being a stupid long wispy tobacco mess. The wrapper is a reddish brown color with only a few small veins. One negative I have on the look of the cigar is the secondary band that says the name of the cigar. Yes, I get it. Fire is cool, but this artwork just didn't do it for me. Thankfully, the primary black Quesada band is elegant and looks great. The aroma of the cigar is heavy on hay notes, with some pepper at the open foot. After carefully clipping the cap, the cold draw was a little sour. After putting flame to this stick, any taste of sourness instantly disappeared and I began to get very pronounced flavors. On the front of each puff, I tasted a lot of toffee that faded into a spicy mint flavor on the finish. This mintiness had a lot of kick to it, but it also was cooling and left my palate feeling clean. 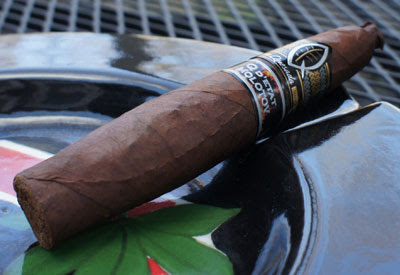 The draw was great and the burn was quick until reaching the fatter part of the cigar, where it slowed down. Speaking of the bigger part of the stick, once I reached this point, the flavor profile changed up. The toffee I had experienced before was now more leather tasting, and the spicy mint finish turned into black coffee. Interesting. I smoked this cigar after dinner and at this point, I'd put the strength in the medium range. 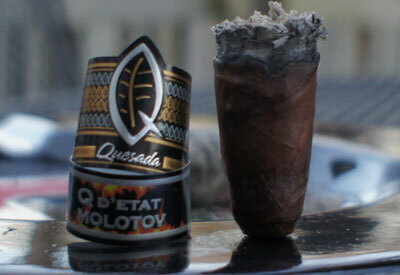 The second third of my Q D’Etat Molotov continued on with lots of leather flavor on the front and black coffee on the finish. For me this was great because I like a nice black coffee or espresso after dinner and this was filling in nicely. The smoke texture during this part of the stick was a little dry, but nothing that made me uncomfortable. One thing to note, and I'm sure you can tell from the picture, is the strength of the ash on this stick. I only ashed this cigar once the entire time smoking it, and there was a bit of a breeze outside. 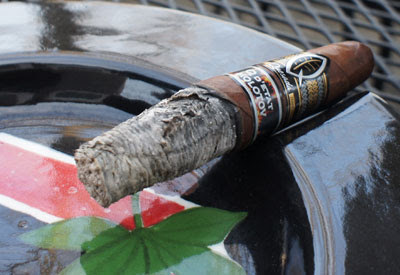 The strength of the cigar was still medium, but reached slightly into full. I finished off the last section of this review talking about the strength of the Q D’Etat Molotov and I'll start this section with it, too, because it came on full boar in the last third. I'd love to see how this cigar was bunched because it seemed almost like a switch between puffs from med-full, to all out hit-you-in-the-gut power. It wasn't a heady nicotine buzz, but rather a full body feeling that got my heartbeat up and running. It was nice because it made me feel very satisfied at the end of the smoke, but I am also glad it wasn't this strong the whole time because that would be too much for me. The flavor in the final third was dominated by black coffee both on the front and finish of the profile. Again, perfect construction with zero problems. 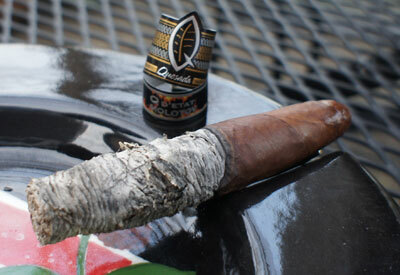 My final thoughts on The Quesada Q D’Etat Molotov? This is a great after dinner cigar. The dark flavors of coffee and leather compliment a meal wonderfully. Be careful in that last third, as the strength really kicks into gear and hits you right in the gut. 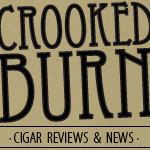 The construction was great and the cigar never gave me any problems with burning out or tunneling. Some might think I'm crazy, but, in my opinion, this is a far better effort from Quesada than last year's Oktoberfest release, which is the last cigar I have smoked from them. Would I buy it again? Yes, I would buy more of these. Would I buy a box? I don't think I'd smoke this everyday, but with a limited amount being made, I'd order a box to keep around no problem.